전라남도 승주군 낙안면 금전산의 서쪽에 있는 절터에 삼층석탑과 함께 있다.『동국여지승람』에 ‘금전산에 금둔사(金芚寺)가 있다’고 하여 이곳으로 추정하고 있다. 지붕 모양의 보개(寶蓋)와 대좌(臺座)를 갖춘 이 불상은 직사각형의 평평한 돌 한쪽면에 불상을 조각하여 마치 거대한 비석의 형태를 하고 있는 것처럼 보인다. 민머리의 정수리 부분에는 낮은 상투 모양의 머리(육계)가 솟아있고 얼굴은 원만한 형태이다. 신체는 우아하게 굴곡이 있어 부피감이 느껴지며 단아해 보인다. 양 어깨에 걸쳐 입은 옷에는 평행의 옷주름이 형식적으로 새겨져 있다. 양 손은 가슴 위로 올려 양 손의 엄지와 검지의 끝을 맞대어 설법하는 모양을 하고 있다. 불상의 뒷면에 글이 새겨져 있는 것으로 보이나 마멸이 심해서 읽어내기 어려운 상태이다. 뒷면의 윗부분에는 보살상을, 아랫부분에는 코끼리상을 조각하였던 것으로 추정된다. 보개는 탑의 지붕에 해당하는 옥개석과 모습이 비슷하다. 대좌에는 아래로 향한 연꽃잎과 위로 향한 연꽃잎이 새겨져 있다. 다소 엄숙해진 인상, 투박한 옷자락 등의 표현은 9세기 현실적인 사실주의 양식의 특징을 보여주는 귀중한 예라고 할 수 있다. 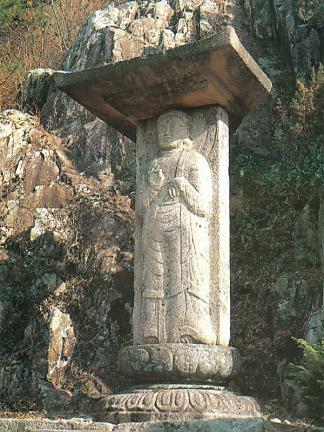 This stone stele stands on a ruined temple site at Geumjeonsan Mountain. 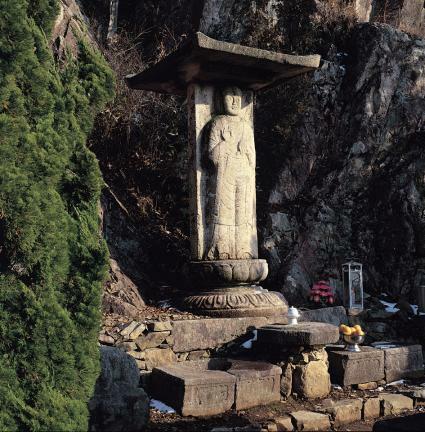 The area is presumed to be a formal site of Geumdunsa Temple; a record in Dongguk yeoji seungnam (Augmented Survey of the Geography of Korea) states thus: “Geumdunsa Temple is located on Geumjeonsan Mountain.” This stele with roof-like canopy and pedestal has a Buddha statue carved in relief on one side of a large rectangular stone, forming a huge stone monument. 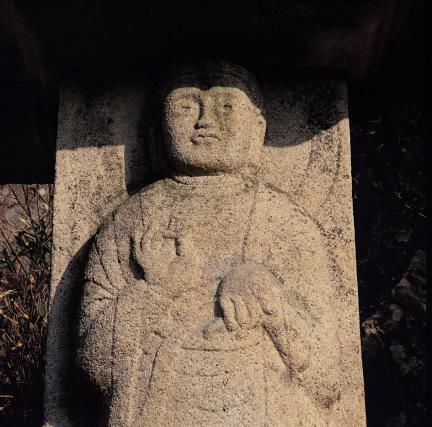 A low usnisa (protrusion on the top of Buddha’s head) rises on top of the head, and the face has a soft shape. The well-proportioned bodyline looks solid and refined. 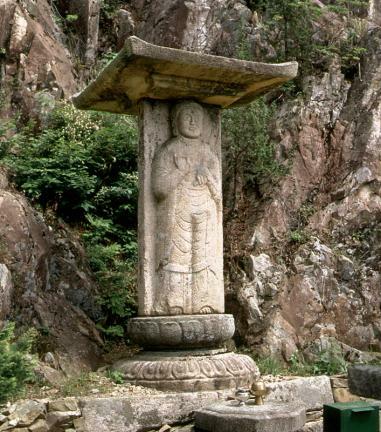 The sacerdotal robe draped over the shoulders is carved with horizontal pleats. The two hands are on the chest, with the thumbs and forefingers touching each other. 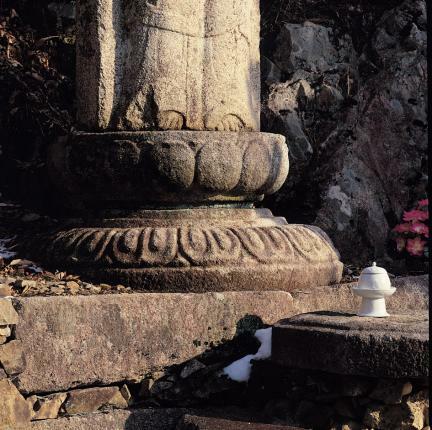 There is an inscription on the rear of the Buddha statue, but it is illegible due to serious weathering. 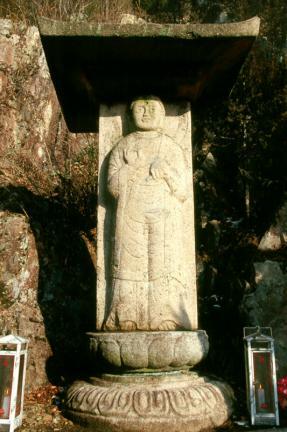 This stele is assumed to have originally had a Bodhisattva statue on top of the rear side and the elephant statue on the bottom. 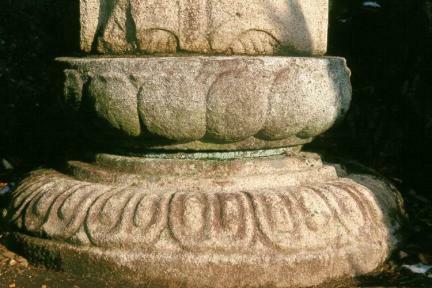 The finial ornament has a shape similar to a roof, with lotus leaves facing downward and upward carved on the pedestal. Expressions such as stiffer face and coarse hem are important examples showing the characteristics of the realism prevalent in the ninth century.